Quest is such an amazing feature in Little Big Snake game! 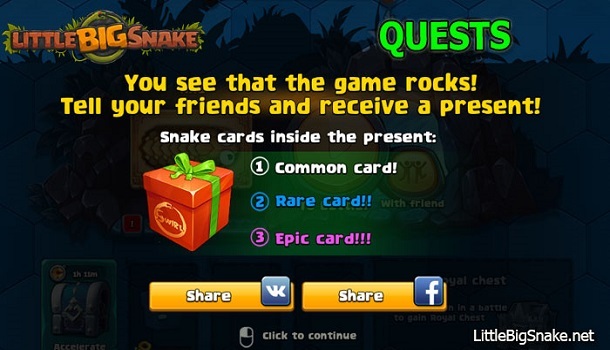 There are so many quests that you can join and conquer them all to earn a lot of coins. Every quest requires you to solve specific tasks, enhance your abilities, make an evolution to your snake, or even engage in the required number of battles to complete it. You can check out the quest in the Lair section at the main homepage of the game. Try to read the missions, the details of the quest carefully, as well as its conditions. There is also a share button in this quest section. You can share what you have got with your friends via VK or Facebook. Sharing the game with your friends can even help you unlock new snake skins. So, feel free to share it so you can get more! Move on. Gain next level 2! Remember, that the new levels grant access to Royal Achievements that add bouns to recelved gold and rating! Time to improve your skills. Go to Evolution tab and improve any skill you believe is important.